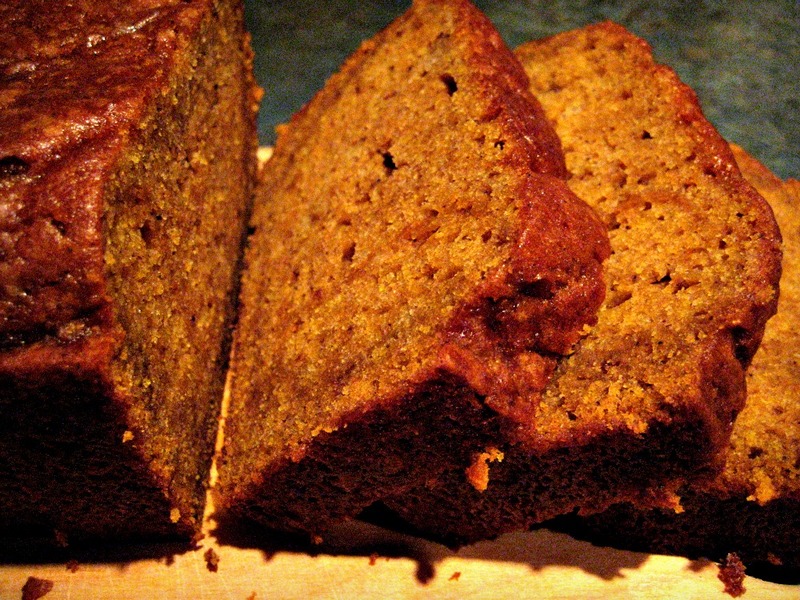 If there is happiness in bread form, it is pumpkin bread. But, I guess I equate any bread with happiness, so that first statement isn’t terribly profound. But still, how can you not be giddy when you those see thick, soft slices of pumpkin bread – that deep caramel color with a pop of orange. Oh! The sight makes me happy, warm and tingly all over. Instead of saying “I have butterflies in my stomach” the saying should be “I have pumpkin bread in my stomach,” because odds are good that there IS pumpkin bread in your stomach and I’ve heard some butter flies are poisonous, so they really don’t belong in your stomach anyway. 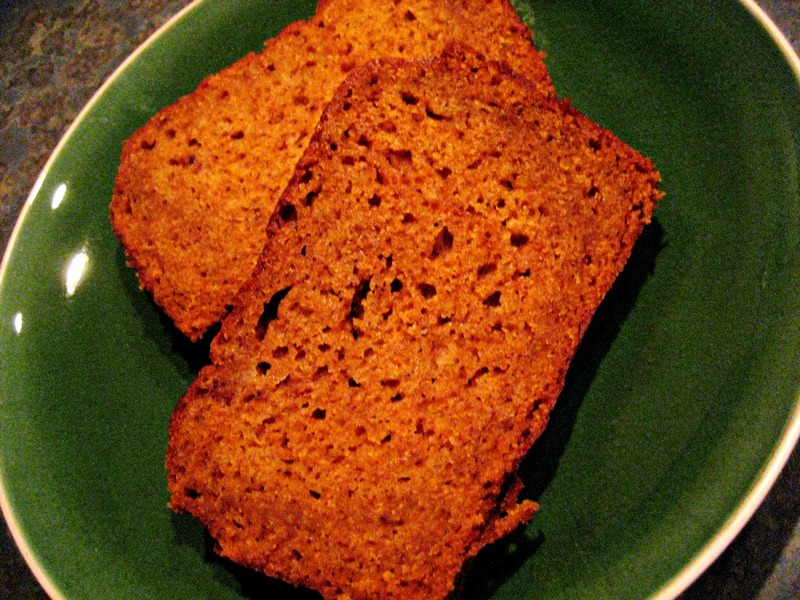 I remember this pumpkin bread was still warm when I had it for the first time at Bunco and it was all I could do not to finish the loaf, which would have been okay really, since the recipe makes two large loaves. The girl who brought it, Tiah, said it won a blue ribbon at a local fair and sent me the recipe afterwards. For those of you that don’t do the potluck thing (a.k.a. males), when someone requests the recipe for what you brought, it means you won. Below is the original recipe, but I adjust two things: I cut back on the oil (3/4 cup) and the sugar (2 1/2 cup). It’s just a little too sweet and greasy for me in its original form. And of course, you know how I feel about the use of pumpkin and cinnamon in baked goods… could an extra spoonful really hurt? The trick to making quick breads and muffins is not to over mix the batter. It’s okay if you can still see some flour clumps. When it comes time to add the dry ingredients to the wet ingredients, I always use a spatula and not a wooden spoon and I make big, slow sweeping motions that scrap everything off the bottom and bring it to the top. When it comes to baking the loaf, you can use the toothpick test to make sure it’s done, but just like with cookies, don’t be afraid to under bake it a bit and leave a spot o’ gooiness to it. Is there a baked good that isn’t better just a tad underdone really? Of course, you can add chocolate chips to this or nuts. Whatever turns your crank. It makes two large loaves so you can experiment with one and see what you like. Or, make two and give one to a friend you generous human being you. Me, I like it plain with a generous smear of butter. Is that weird? Does anyone else like pumpkin bread with butter on it? Cream sugar and oil together, then add eggs and pumpkin, mixing well. Sift together the dry ingredients, then add to pumpkin mixture, alternating with water. So, place 1/3 of your dry mixture in with pumpkin mixture – fold – add half of the water – fold – add another 1/3 of your dry mix – fold – add last of water – fold – add last of dry mixture – fold. Pour mixture into two pans and bake at 350 for 60 minutes. *I’ve also made this in one 9×5 and one 8×4; or one 8×4 and two mini loaf pans. This looks delicious! It looks very similar to a pumpkin bread that I made a few weeks back! Wow you’re right, I think it’s identical except for the ginger vs. all spice! I need to ask Tiah if one’s allowed to enter an Allrecipes.com recipe into a fair 🙂 Yours is much more brilliant orange – I like it! I want to try your cinnamon crumble banana bread soon. 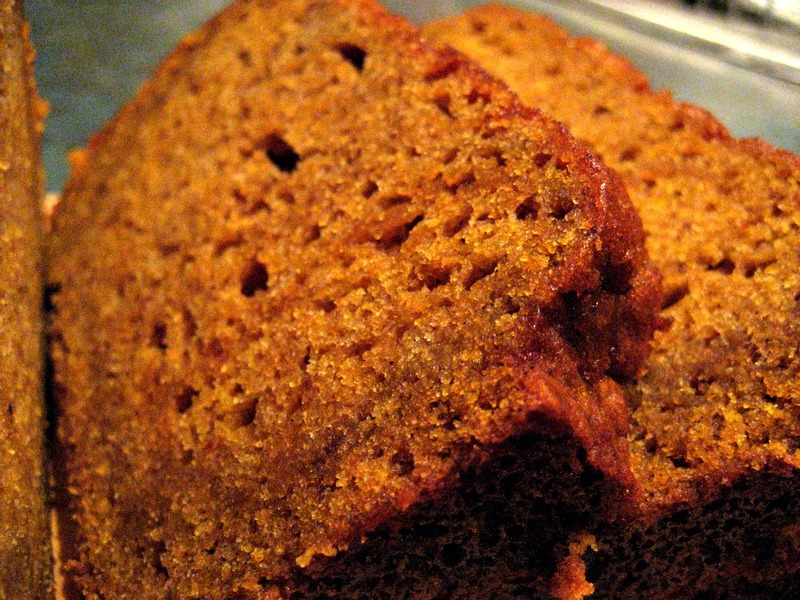 This is by far the best pumpkin bread I’ve ever tasted. Melts in your mouth and not too greasy. Thanks for the recipe!